pico projector, 3M pocket projector (CETUS Mini-Projector MP1) - Cetus International Ltd. 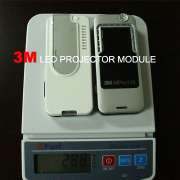 It is the SMALLEST size projector in world which is only 160g. With 3M solution, this is the first LED projector in the world and it only needs 10W in power consumption. RoHS compliant products and it is with FCC and CE safety certification. It can connet to Leptops, PDAs, Video Phones, Videocams, Digital Cameras, Mobile PCs, DVD, Digital Media Players, and so on. 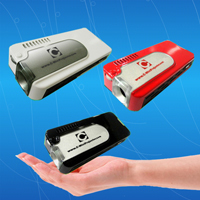 CETUS MP1 is the only Pocket Projector which can connet to PCs directly.